Nestled in the mountain town of Roanoke, Virginia, is a four-story converted warehouse just off a busy industrial corridor. Called The Lofts at West Station 2, it’s a 100-year-old building packed with immense character, having once served as a feed manufacturing warehouse. But it’s the future of this building—and its surrounding neighborhood as a holistic place—that we’re most inspired by. With exposed timber beams, vaulted ceilings, colorful murals, and custom-design graphic installations, the 56,500-SF project offers 71 apartments to the city’s booming downtown experience. Residents have access to an array of modern amenities, including a theater, exercise studio, and the adjacent Big Lick Brewing Company (for which Baskervill did the interior and exterior architecture). That mix of features? They were all intentionally curated and designed by our team to evoke a distinct identity of place, says Sheena Mayfield, AIA, lead architect of the project. “One thing we know as urban designers is that people want their everyday experiences to take place in small, clustered areas that can serve up everything they need,” Sheena says. To truly deliver on that lofty promise (pun intended), social epicenters such as Lofts 2 rely on a simple yet powerful design concept: placemaking, or the creation of places that have been designed with people in mind. Placemaking as an idea has been around for nearly five decades; in recent years, the philosophy has skyrocketed into a widely used civic design process involving developers, architects, urban planners, city leaders, and citizens coming together to create dynamic, community-driven places that contribute to the health, happiness, and well-being of residents. 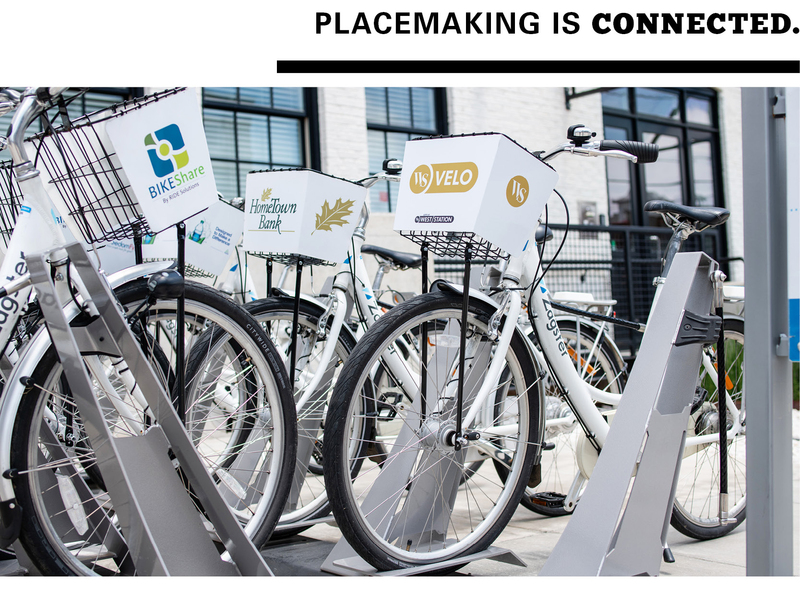 Many factors go into placemaking, Sheena says, from accessibility and comfort to how sociable and activity-rich a community is (like the influx of hikers and bikers in Roanoke). There are, of course, some common threads woven throughout the most successful of these developments, big or small. Here, we break those essential elements down through the lens of Lofts 2. Studies show that people want to live in places where they can access everything they need without a car. In fact, one in five residents prefer living in a walkable community with short commute times, even if it means spending more on housing. That’s why the most successful placemaking projects are intentionally designed at the human scale, keeping everything convenient and close. Add in amenities like a well-maintained network of sidewalks, close proximity to public transportation, and dedicated cyclist resources like bike lanes and racks—and you’ve got a neighborhood humming to the beat of a classic: made for walkin’. Located along an industrial corridor that’s seen sweeping revitalization efforts in recent years, Lofts at West Station 2 is within steps of a brewery, a taqueria, retail outlets, small businesses, and the Virginia Museum of Transportation. Strategically placed benches offer pedestrians respite; sidewalks encourage easy exploration of the West Station neighborhood, and for those inspired to venture beyond the neighborhood, there’s a bike share station on site. Why not have it all on one block? Piece by piece, that’s how design and development stitches together connected places out of what could otherwise be difficult-to-navigate spans of community. No placemaking development is successful without first designing a clear brand identity. What is the character and aesthetic of the neighborhood? What is the historical context of that community, and how does it fit into the fabric of the larger city? For Lofts 2, our designers and strategists partnered with the developer early in the process to craft a unique brand identity not just for the building, but for the entire neighborhood. Because it’s an addition to a number of other Baskervill-designed projects within an industrial district (416 MicroFarms, Fulton Motor Lofts, and the award-winning original Lofts at West Station) Lofts 2 artfully picks up where those projects left off: by telling the story of the surrounding area’s legacy as a transportation hub. Visceral and cherished, those iconic elements are the pieces that build up a brand identity. The heritage that community members take pride in and the subtle design details people gush about again and again when asked: What’s your favorite thing about where you live? Using that knowledge and passion from current residents and community members, we injected the very best parts of the original Lofts, mimicking its striking stoning and floor transitions at Lofts 2. The design team also created custom mural graphics for the corridors and added a life-size train wheel to the building’s exterior. Each of these pieces complement the overall design strategy to help tell the story of the West Station area in an effective and meaningful way. Placemaking is rooted in immersive, inclusive design and the experience of the humans who will use it. It takes into consideration how the curation of businesses and amenities can work together to bring a diverse mix of people into the neighborhood, day and night. People are drawn to spaces where they can gather, connect, and celebrate—and they’re looking for a “wow” experience to match. Resources like farmer’s markets and community gardens—and attractions such as walking trails and libraries—and service-oriented businesses like banks can elevate a development project from a mere collection of buildings to a thriving, socially-connected community. 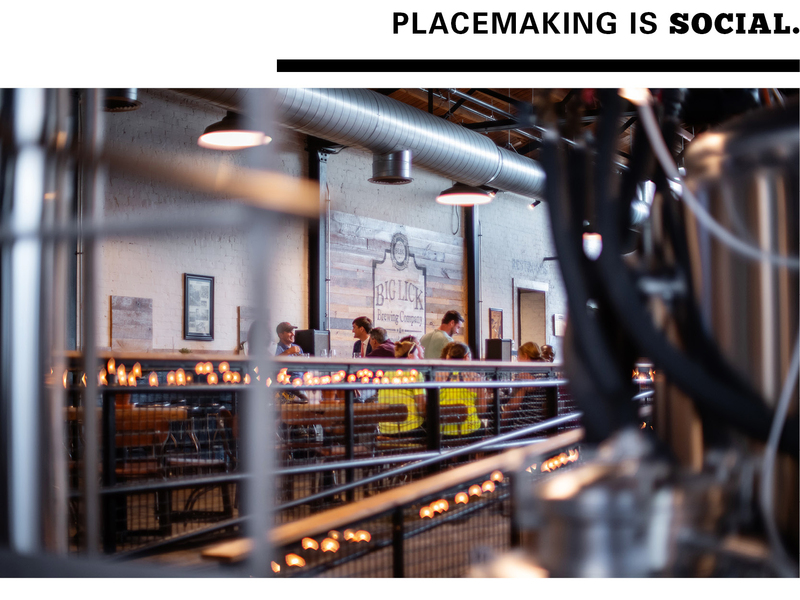 As a greater emphasis is put on immersive design, creating spaces that act as lively backdrops to this growing experience culture is essential, and that’s a big reason why the developer of Lofts 2, Bill Chapman, brought in Big Lick Brewing Company. With a roomy dining area and expansive front patio, the craft brewery is an ideal spot for residents of Lofts 2 and locals to gather. Beyond the brewery, Lofts 2 features a handful of other spots for residents to unwind and have fun, including small lounges and a movie theater. We’ve said it many times, and we’ll say it again: Intentional design can profoundly affect how people experience a space—their actions and how they feel and think. It takes a strong sense of place for people to connect with the unique and special aspects of a community. With a strategic mix of elements meant to harness those brand standouts and amp up connection and socialization opportunities, a thriving community is born—with more than just brick and mortar, but personal and purposeful spaces that people will value and call home.